What I am sharing today is baked doughnuts. This is actually muffin recipe. I put the dough in a doughnut pan, and it turned out really good. 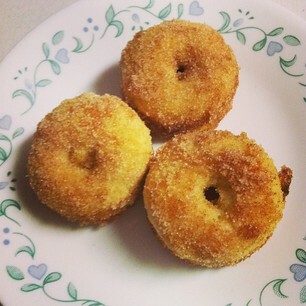 After the doughnut is baked it in dipped in melted butter and covered in cinnamon and sugar. If you don't have a doughnut pan, make it in the muffing pan (as this is muffin recipe anyway) and dip the tops in butter and cinnamon sugar. Grease your doughnut pan (or muffing tin), fill 2/3 full. Bake at 350 degree oven. I would not go that long for doughnuts, I check them at about 10 minutes. You want to bake them until they are golden brown. Once they are baked, dip them in melted butter and then in a cinnamon sugar mixture. These sound great! I've been seeing recipes for baked donuts everywhere, and really need to give them a try!